For those of us focused on waste prevention, recycling and waste treatment, the concept of landfill mining still seems a little odd, according to an extract from a paper written by Adam Read, practice director for waste management at consultants Ricardo-AEA. Read poses the question: “How does landfill mining fit with closed loop economies and resource efficiency agendas? “Landfill mining perhaps conjures up images of people scavenging for a living on open dump sites in developing countries, and at its best it could be considered an unusual twist to the waste hierarchy by trying to recycle materials previously disposed of. But, it is a much more scientific, professional and potentially mainstream than this,” continues Read. The word “potentially” is the one that stands out. In the past few months landfill mining has garnered a fair amount of attention. The EU Enhanced Landfill Mining (ELFM) consortium met for the first time last October, the same month that BBC Radio 4’s Costing the Earth show covered the topic in some detail. Presenter Tom Heap suggested the concept could “change the way we look at ‘landfill sites”. Indeed, with a reported 5,000,000,000 tonnes of waste buried across Europe in its half a million landfill sites, there is energy and material aplenty to unearth, recover and reprocess. While much of it is valuable, some of it is precious. Dwindling supplies of minerals and metals are causing concern among manufacturers. An EEF (an organisation representing manufacturers) survey in 2012 showed that 80% of manufacturers regard shortage of raw materials as a risk; two thirds of those actually identified it as their top risk. At January’s World Economic Forum in Davos, Switzerland, the head of Philips suggested that mining metals from WEEE could provide more gold than traditional mining. 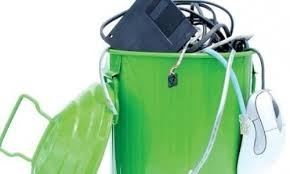 “There is more gold coming out of e-waste than actually out of the mines, e-waste has a lot of value,” Frans van Houten is reported to have said in a waste panel session. The first landfill mining might have taken place 60 years ago, but this year will bring the world’s first full-scale ELFM project. Lying beneath the Remo Milieubeheer landfill site in Houthalen-Helchteren, Belgium, there are 16 million tonnes of waste. Rolf Stein is CEO at Advanced Plasma Power, one of the companies involved in the excavation. “Landfill sites can now be mined for their valuable recyclates because rubbish dumps and historic waste streams contain higher concentrations of valuable materials, such as metals, that will be processed and recycled,” according to the CEO. Stein says that 55% of the waste unearthed at Remo Milieubeheer will be recycled, with the remainder transformed into heat, power and fuels. It’s the first project of its kind, so there is no precedent or template for bringing such a scheme to fruition and this “presents some challenges,” he admits. These are being researched by the trans-disciplinary ELFM consortium, which was set up last year to support the technological, legal, social, economic, social and organisational innovation required to make the most of the interest and potential in landfill mining. Chairman of the consortium, Peter Jones says the interest for the group is “overwhelming”. “You will see [landfill mining] is a rapidly growing topic, which will be difficult to stop,” he tells RWW. The mining process in Belgium is expected to start in 2017, since the required permits are likely to be acquired in 2015. From this year the temporary storage concept will be deployed and researched at the ‘Closing the Circle’ site. As with all new technologies and concepts, the initial projects are the most expensive and there is the need for subsidies, admits APP’s Stein. But as economies of scale increase, prices will come down, he adds, and the need for funding support will diminish. “Once the concept has been proven, it can be applied to the billions of tonnes of waste that currently are in landfills across the globe,” he claims. The big advantage with the site is the detailed documentation of the waste buried there. This isn’t always the case as “less managed sites” are more of a challenge. Indeed, commercially extracting and processing useful materials from existing landfills will be a costly operation, so the cost per tonne of any recovered material will be high. For Neil Riding at engineering consultancy, Wardell Armstrong, the comparable cost of other forms of recycling and material recovery are likely to be much lower for the foreseeable future. “A company looking for plastics and other materials with a high calorific value for combustion and energy generation – where revenues could alter the financial viability – might want to mine only those materials. “But the cost of mining would probably dictate that other material such as metals – perhaps including high value precious metals – would also be targeted in order to generate as much value as possible,” he says. Speaking on BBC Radio 4, Sita UK’s technical director Stuart Hayward-Higham, said the process of digging up valuable resources is “logical”, but there are currently a number of economic barriers, including the release of land for development, the recovery of the commodities and the recovery of energy. As a competitor to traditional mining, landfills might have an economic and environmental advantage. New mining operations can take 10-20 years to be developed from scratch, so physical supply responds more slowly than the economic cycle. This explains van Houten’s concerns at Philips. The metals mining industry has also been estimated to account for between 7-10% of global greenhouse gas emissions. However, there are localised environmental factors to consider, such as dust, noise and groundwater contamination. The process of landfill mining could also bring hazardous materials like asbestos to the surface. As with any such project, the economic, environmental and social impacts will need to be considered on a case-by-case basis. Waste quantity and composition are critical as these will determine the economy of scale and potential revenues associated with the operation. In terms of composition, waste from the mid-1960s to the mid-1990s is likely to yield the most valuable materials, given the profligacy of society at the time and the lack of recycling facilities available. Sita UK is one company that’s looked at some of its landfill sites in an attempt to quantify what’s buried, how to dig it up and how to recover the materials. Technical director Stuart Hayward-Higham told BBC Radio 4 that he “definitely” expects to see landfill mining take place in his lifetime. After all, there is gold in them thar holes.